I finally made it to the paint store to purchase my Annie Sloan chalk paint (click here). Many bloggers are already in love with it. When I learned of this paint on Miss Mustard Seed’s Blog and Southern Savvy Style, I was very excited to try it. I did some research to determine where I could purchase the paint and wax, only to find that that it is sold in a very, few stores. I was happy to locate Wonderfaux Studio in Stafford, Texas. They were well stocked on the paint, wax and supplies. I met Ricky and Michelle, the owner. Both were very helpful and knowledgeable about how to use the paints. Below are some photos from the studio. I had so many projects; I couldn’t wait to start. I really did spend some time thinking about what I would do first, since I am pretty busy these days. I decided on an old French bistro set I have. Here is a BEFORE picture. I selected Louis Blue for this project. Below is a picture of the chair after I painted it with the Annie Sloan chalk paint in Louis Blue. I know you are supposed to put on a solid layer of paint, but I am always looking for a LAZY MARTHA way of doing things, so I did a “sloppy” job, meaning I let the old paint show through in places, rather than completely covering every surface until none of the old paint showed through. I thought this would allow me to use a little less paint, and save some time when I distressed the chairs and table. Ricky told me that the chalk paint can be removed in places with a cheesecloth, but I preferred sandpaper. Yes, when the paint is very wet, the cheesecloth will remove the paint, but in my case, it removed more paint that I wanted removed. So, I used medium grade sandpaper AFTER the paint completely dried. As advertised, the paint stuck well, and sanded off well in places, without peeling. After the paint was dry, I applied a combination of dark and clear wax. It may not mix well when the wax is in a solid state, but in the outdoor heat, it was liquefied to some extent. It still went on fine. The chair on the left below has the wax on it, and the one on the right is before the wax was applied. You can see that it is a little bit darker after the wax in applied. Below are some close-up photos of the chairs. The paint underneath, if you remember was a dark green, but in the photos below, it looks like a dark blue. I like it!! And below, I have shown the set together with a pitcher of lemonade. To see close-ups of the silver, click here. I did get some advice from Lady Butterbug from Feature Friday, who said it is not recommended to wax outdoor furniture, but she said that once the wax is hardened, it should be fine. My set seems to be doing just fine on our front porch. Wow, I am totally intrigued by your talent and your keen style. Love the outcome of the bistro set and I look forward to seeing what’s next! WOW! I am really diggin chalk paint. Your bistro set turned out beautiful, love it with the wax finish! I fell in love with this paint ever since I saw it on Miss Savvy’s blog. I’ve got several items I want to try it on I just can’t settle on a color…maybe some day soon. That turned out great. Love the color. Lucky you to have a store to go buy it from. I have to order it. Shipping is killing me. Thanks for the link and I would love to have you join my party tonight. I LOVE it. The color and distressing are really nice. The bistro set is fabulous. I think everything looks great. How lucky you are to find a store. By the way, I like the sloppy way sometimes too, adds character. Thanks for following me. I’m finally able to follow you. LOVE it, Anita! I have only tried the clear wax, but the dark wax is beautiful!!! Thanks so much for linking up with The Ivy Cottage Blog. Awesome!! I’ve never heard of chalk paint, but it looks really cool. So I briefly glanced at the site; you use it just on furniture? I haven’t tried this paint yet, but all the beautiful projects are wearing me down. 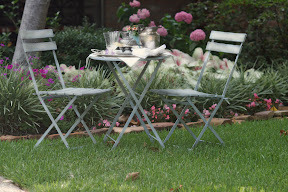 Your bistro set is fabulous and I can’t wait to see more projects. Anita, it turned out great! Your pictures are just beautiful. I love chalk paint! My use for chalk paint was not as creative, but it was still fun! Ok…..the more I hear about this magical paint, the more I want to try it, Anita! 🙂 Your little bistro set turned out just beautiful! I adore the color you chose – so soft and neutral. Thank you for the great tutorial, too! I love the result. I am dying to try it. this is really fabulous! It turned out beautifully and I love the color you chose. I think I could have my morning coffee out there everyday 🙂 I’d love to invite you to link this to my Wednesday party, Transformations and Treasures! hope to see you soon! Thanks for the sweet comments. As for using the wax outside, so far, so good. I’ve had no problems. Denise, I linked up to your link party. As for local retailers for the Annie Sloan paint, I think she is adding stockists as we speak, so I think it is coming. Thanks for sharing this at WUW. Great job! I love the new color! This turned out wonderful….love how you left it shabby! Can’t wait to see more makeovers with the chalk paint and wax. It looks wonderful. I would love to try this paint but it seems that I cannot find it close by me here yet in Tennessee. I love your makeover, so pretty! I can’t wait to try the chalk paint out. Thanks for linking up to memakingdo, I featured this! Following from the weekend hop! Hope you’ll return the follow: http://www.wittyones.blogspot.com. 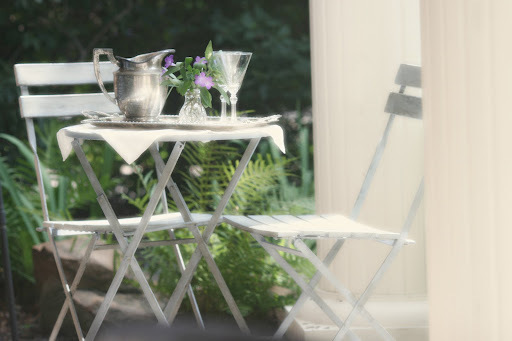 Gorgeous, sweet bistro set! Your project turned out beautiful–and your photos are so pretty–a magazine setting. This turned out so pretty. I have yet to try the chalk paint but I love how your little french bistro set turned out. I especially love it with all the silver on it and it setting on your porch. It totally transformed it. This set is gorgeous! I haven’t done anything with Louis Blue yet…I’m hooked on Antibes Green! Isn’t chalk paint the best??? Glad to have found your blog. Looking forward to reading your posts! You did an amazing job on the transformation of your bistro set! Loving the chalk paint! I have happily just become a friend and follower and hope you will visit and consider same. I really love your pictures.Everything looks so clean and perfect. I am very impressed by you blog and the pictures are gorgeous. I am following you via FNF blog hop. Also your newest GFC follower. If you have get a chance stop by and follow my blog. Let me know if my GFC is working or not. I have been having problems with it. featured this today at The Ivy Cottage Blog! thanks for linking up, Anita! I am sponsoring a giveaway with Michelle right now. I see my button so maybe you already entered. Plse do so you too might win three quarts from Michelle. Love how your set turned out!!! Wax is great over outside things too. 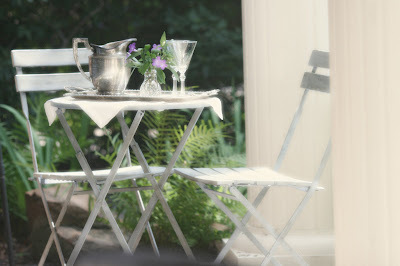 Your bistro set looks splendid! I love the color and the way you distressed it. I am going to buy some chalk paint when I get my next paycheck. I can hardly wait! I am a new follower on GFC. I found you through New Friends Weekend Blog Hop. Hope you can stop by my blog and check it out and follow back. That is just gorgeous Anita! I love that you “took a risk” and didn’t put too much on so that the black showed through. It really gives it that feeling of being aged and has so much charm and character. You did a fantastic job and I can’t wait to see more of your chalk paint projects! 🙂 Thanks so much for sharing this at Inspiration Friday this week! Beautiful! I’m your newest follower from the Sunday hop. I’d love for you to link up to my Tasty Thursdays Recipe Swap Blog Hop later this week. I can’t wait to read more from you! Your setting looks beautiful – you did a great job! Just stopped by from a Friday blog hop. I’m following you now and hope you’ll stop by my blog sometime too! Have a lovely week. Thank you so much for having such a nice and entertaining stuff for us. I really enjoy your blog and the way you have describe your content.